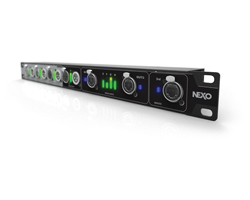 Nexo DMU Digital Patching Unit for NXAMP Powered TDcontrollers. The ultimate tool for easy connection between the NXAMP powerd TD controllers and any Nexo speaker in live environment. DPU mains features Intelligent output patch panel offering digital communication with NXAMPs. Provide automatic output speakons wiring regarding the configuration of the NXAMP. Intelligent input patch panel offering digital communicationwith NXAMPs. Provides input level meters on all analog and network inputs. Fully passive design on the audio and network paths. Powered through the host NXAMP, no need for mains supply. Four individual LCD for easy labeling of the outputs speakons. Integrated VU-meters 8 channels of 8 levels VU-meters, one per input (4 x Analog and 4 x Network). Network activity 2 LEDs per network input. Analog audio connectors 4 x Neutrik XLR-3 with parallel output link on XLR-3, named from A to D.
Network connectors 3 x Neutrik Ethercon connectors, named from 1 to 3. Analog audio connectors 4 x Neutrik XLR-3 passive connection to front panel XLR. Network connectors 3 x RJ45 connectors, routed to front panel through matched impedance pairs. GPIO connector DB-25 for digital communication and power from host NXAMP. Power supply From GPIO port, 5 Volts DC, 1Watts. Dimensions 1U 19 Inch Rack - 50 mm (2") Depth. Weight 1.2 Kg (2.6 lbs) net. Green status Compliant with ROHS and REACH directive.